Note: Written in 2012. Here is the updated version ranking and rating all spring training parks. For more than a decade, Phoenix Municipal Stadium has unquestionably been the most rudimentary facility in the Cactus League. 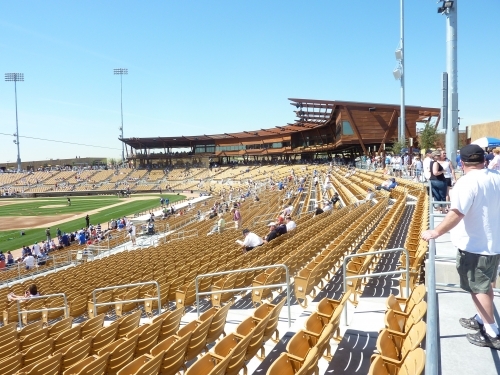 Since 1994, spring training in Arizona has been on the frontier of numerous modern ballpark trends rarely seen before, including 360-degree open concourses with outfield berms, party decks, suites, video boards, even fold down seats with cup holders. Despite a small renovation in 2003, which had little consequence on the fan experience, Phoenix Muni simply doesn’t compete with the other facilities in all categories. A representation of a bygone era of spring training, the ballpark is most well known for its unmatched intimacy and scenic outfield backdrop, consisting of the geologic formations of Papago Park. I went here back in 2005, but decided not to rate it at all because it is about to be replaced. Luckily, the ballpark is being put to good use as the home of the Arizona State Sun Devils. Of the newer parks in Arizona, this is clearly the weakest link of the era, compared other parks in spring training that opened from 1994-1998 which score 8-12 points higher. The setting is laughably bad, as the ballpark is located adjacent to the City of Mesa Cemetery. As you can read extensively, the exterior and interior aesthetics are remarkably bland for the era. To add insult to injury, the main concourse has a number of weird discontinuities and fans can’t access the outfield berm area for batting practice, which is the most fan unfriendly ballpark policy in the Cactus League. Obviously, the fans are the park’s greatest asset. Despite the lively atmosphere, HoHoKam Park still isn’t an optimal baseball experience. The great fan base cannot alone atone for the soulless yet streamlined architectural design, weird concourse system, lifeless local scene, fan unfriendly ballpark policies, and other various functional flaws. HohoKam Park will be the first ballpark of the era to go through extensive renovations, which will be completed by 2015 for the Oakland A’s. Note: Written when Chicago Cubs were tenant. HoHoKam Park simply doesn’t compare to other ballparks of the era in any category. Tempe Diablo Stadium is a rare ballpark that seems to stay timeless due to only one characteristic: the gorgeous backdrop provided by the buttes beyond left field. While the ratings don’t show it, that feature single handedly makes this a good place for a game. Other than that, the ballpark has few redeeming qualities. Most of the flaws can be attributed to the cramped spatial footprint, as there simply isn’t enough room for wide concourses, comfortable seating, expanded concession stands, sitting areas/restaurants, or any other amenities. The congested suburban location doesn’t help either. The Angels’ lease expires in 2025, so lets hope future renovations can expand the ballparks’ footprint significantly, while also making the ballpark a 360-degree experience. At worst, lets build a new ballpark in the same location. But lets keep the view. Despite numerous objective problems, Tempe Diablo Stadium will always be a timeless ballpark due to the spectacular views. Subjectively, this is one of my favorite spring training ballparks in baseball due to its unmistakable architectural design, but the ballpark is sorely lacking in amenities. The exterior design is unlike any other, with no traditional façade behind home plate and jagged, gray, stonework down the lines. The color scheme throughout the concourses is indescribably differentiated from any ballpark I’ve ever seen, characterized by a minimalist white trellised canopy and an unusual combination of gray brick, imposingly modern capitalized blue signage, and dark pink columns. I don’t know how to construe this surprisingly flavorful combination. The dark blue curvilinear press box is the icing on the cake, anchoring the most unique ballpark in all of spring training. While it doesn’t score too high due to the lack of amenities, Maryvale Baseball Park has a truly timeless design and brings a taste of Milwaukee to Maryvale. 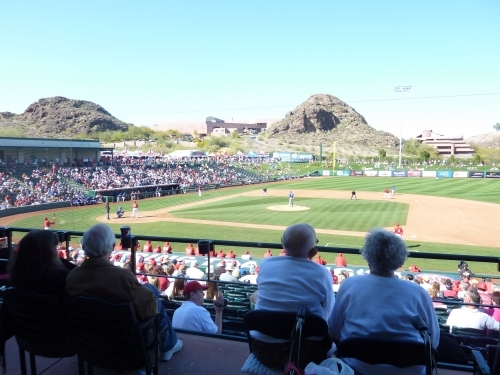 6) Surprise Stadium (2003): Deemed one of the better spring training parks in all of baseball, many may be “surprised,” pardon the pun, to see this ballpark rated so low. 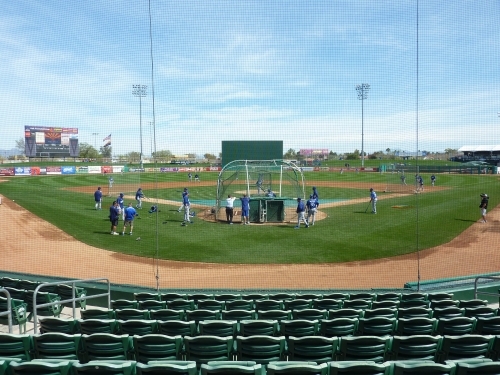 But ultimately, while still nice, this was the most forgettable facility in the Cactus League in my opinion. This ballpark is the poster child for how quickly spring training ballparks age without distinguishing design cues; symbolizes how these parks need to be more than just “state of the art” at the time to enter timeless territory. 10 years after the opening, I really didn’t see anything special about it, in terms of architecture or charm. Anything it did in 2003 someone else has done better, as is always the case, so Surprise Stadium better have brought something to the table that is timelessly unique, charming, or special in terms of amenities. Did it? No, not really. Other than the fan friendly integration of the batting cages/clubhouse, which will get bonus point, nothing stands out. Surprise Stadium still scores well in most categories across the board (although some of the sight-lines down the lines are oddly poor for the era, and the exterior design and atmosphere are subpar), meaning it’s still a good ballpark, but there really isn’t anything special here. To me, it just felt like a new HOK spring training cookie cutter. But remember the Grapefruit League parks are a tad lower, so this is still probably in the top half of spring training. Surprise Stadium is a nice modern facility, but it doesn’t stand out in a crowded landscape of good ballparks in the Valley. 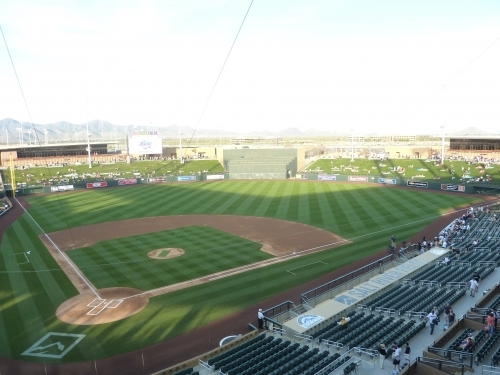 Despite all of the hype surrounding the facility, most fans have been underwhelmed by the experience at Goodyear Ballpark, especially in comparison to Camelback Ranch, which opened the same year. 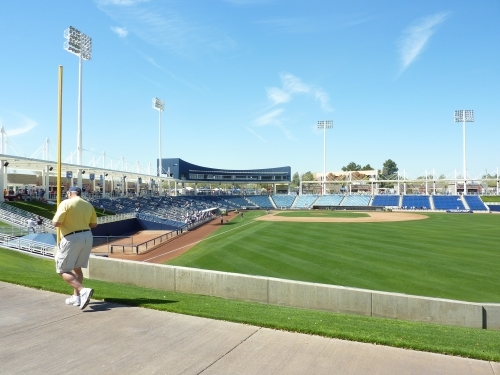 But fans need to understand the merits of Goodyear Ballpark depend on its future development. 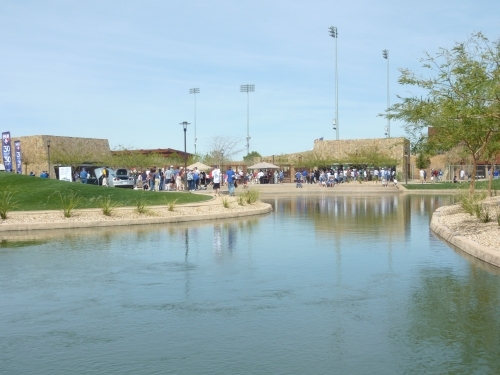 Much of Goodyear’s appeal is based on its unique mixed-use development strategy, which is the first of its kind for spring training. Developers will seek to integrate buildings essentially into the ballpark structure itself, loosely similar to the formerly planned Cisco Field. That is indeed, like no other ballpark period. As it stands currently, Goodyear Ballpark is certainly a good facility. The exterior design is groundbreaking and the concourse system is excellent, as the ballpark generally excels across the board in terms of functionality and amenities. On the flip side, the drab ballpark atmosphere is a serious problem, as these paltry crowds seem like a pervasive issue. Nevertheless, the bottom line is no ballpark in spring training and maybe all of baseball has more potential than Goodyear Ballpark. Assuming the development plan does work out, you have an aggregate increase in 10 points when you look at location, interior design, and bonus. But as of now, it just feels distinctively unfinished. The wide-open grass areas down the left and right field lines are a poor allocation of space and generally symbolize this sensibility, along with the dirt plains beyond the outfield. 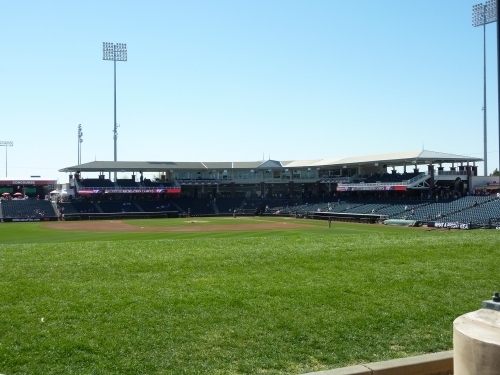 On the surface, Peoria seems like a pretty ordinary ballpark, one that seems like a boring southwestern-style spring training cookie cutter. But 20 years later, the ballpark somehow manages to stay relevant in my mind, due to its constantly improving array of amenities, fan friendliness, local scene, and the simple factor that it is the ancestor of all of these other Arizona ballparks. 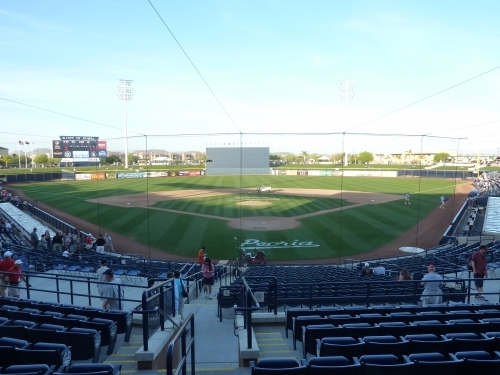 While many have improved on it’s initial design, Peoria Sports Complex was a trendsetters and more importantly, a successful ballpark, similar to Camden Yards in major league baseball. While it arguably started in 1991, this was perhaps the first super spring training stadium. It had club seats, a wide 360-degree concourse, and an expansive outfield berm. In terms of architecture and team amenities, it was an ambitious design concept. 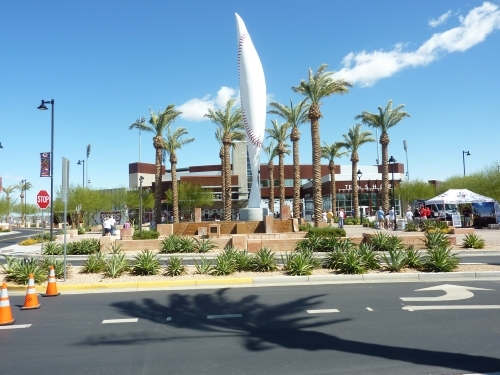 Beyond the fact this was the first instance where people recognized they could have true major league amenities by pooling the funds from the town for two teams instead of one, this was also the first spring training ballpark that successfully served as a catalyst for economic development in the area. 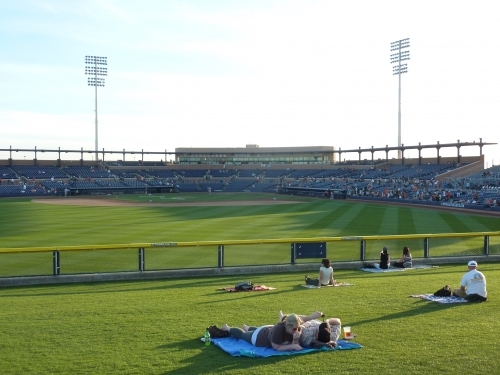 Other amenities like the Peoria Power Alley, providing a street fair like atmosphere, and the outstanding array of concessions, keep Peoria Sports Complex high in the ratings today. While it’s timeless southwest design isn’t still special 20 years later, it still looks good today too. Peoria Sports Complex was not only a trendsetter for the Cactus League, but is objectively a very good park today as well. It’s canyon wide concourses, shocked concession stands, numerous sit down areas, various entertainment options, fan friendly atmosphere, and now-developed community are more a representation of a sustainable ballpark built to be good 20 years after opening than anything else. The ballpark maintains its Cactus League superiority 20 years later through canyon-wide concourses, excellent concessions, numerous sitting options, and a bevy of kid-friendly features. 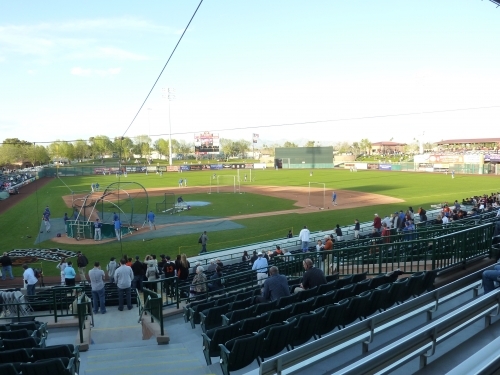 Scottsdale Stadium has always been one of my favorites in the Cactus League, simply because its really the only one left in Arizona that has an old school charm. The ballpark’s primary asset is its location in Old Scottsdale, certainly the most vibrant local scene of any spring training ballpark in baseball and arguably the best overall location. Inside, fans are greeted with colorful array of landscaped trees throughout the concourses and beyond left field, which are arguably the aesthetic strong-point and perhaps the sensation that evokes this old school vibe. The palm court behind the home plate concourse is a must see. 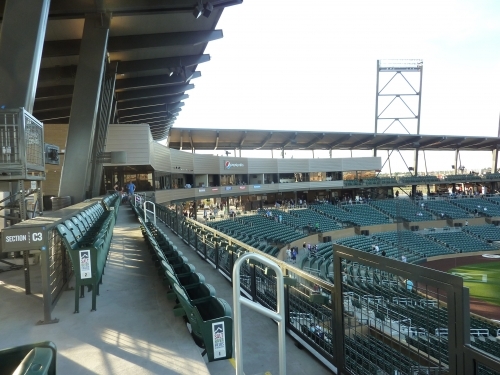 Scottsdale Stadium is not without faults, lacking space for many modern amenities. The ballpark also has some serious sight-line flaws down the lines and way too many bleachers, some of which are even located at the top of the infield grandstand. But what Scottsdale Stadium lacks in amenities and functionality, it makes up in charm, something that is really in short supply in the Cactus League with all these new modern cookie cutters. Full review coming 2014. Scottsdale Stadium has a certain charm and character not seen throughout the Cactus League, while being aesthetically attractive at the same time. It’s primary asset is its urban location. While the newer Salt River Fields at Talking Stick may have outdone the Ranch overall, this is still the most attractive ballpark in spring training, perhaps in all of baseball. I’ll never forget being stunned by the two-acre lake center field entrance, which looked like a resort more than anything else. The exterior setup overall is unlike anything in baseball. The interior is even better. The creative color scheme, with its rustic brown façade and caramel colored seats, is incandescently brilliant. Center field walkway entryway with lake. Functionally, the ballpark is obviously excellent as well. Wide open concourses, wide seats, lots of suites and multiple party decks, all that jazz. Arguably two of the best ballparks in America period, Salt River Fields at Talking Stick and Camelback Ranch have set the standard, towering far above anything spring training has ever seen. Full review coming 2014. Camelback Ranch is truly unlike any other. As you can read in a lengthier ballpark review introduction compared to the two parks above, my initial reaction before attending this ballpark was reasonably tepid. I knew it was going to be really nice, but I didn’t want another Southwestern Cactus League cookie cutter. There comes a point when the level of innovation and sheer amount of money pumped into the aesthetic beauty can’t surpass the fact that not only does the facility lack charm, but has no tangible connection to the team that plays there or the fans that go there, unlike jetBlue Park or the renovated Ed Smith Stadium, which also opened the same year and clearly had Oriole character. Salt River Fields isn’t the aesthetic one-of-a-kind experience like Camelback Ranch, but it’s superior in about every other fashion. But as you can see, I was still blown away by Salt River Fields, which is arguably the best ballpark in America. Despite not having the wonderfully unique aesthetics of Camelback Ranch, Salt River Fields is attractive enough, while completely blowing every other ballpark ever built out of the water in terms of innovative design ideas. The concept of integrating concession stands with tables and chairs down the left and right field lines in the cross aisle is simply brilliant. It’s an excellent use of space. Second of all, the “Pepsi Patio” atop the press box is wonderfully fan-friendly feature, creating a party atmosphere seen nowhere else in the Cactus League. Functionally, and really objectively overall, this is the best ballpark I have ever seen. It takes ballpark landscaping both inside and outside to an unbelievably extensive level. The berm is sloped perfectly. The sightlines are noticeably better in terms of seating geometry. The seats are 21 inches wide. The concourse visibility and circulation somehow take another step forward in functional innovation. The video board is way above anything we’ve ever seen in spring training. The concessions are fantastic. And it goes on and on. Overall, this is the best ballpark I have ever reviewed, major league or spring training. View of Salt River Fields from behind home plate.